Milk thistle (Silybum marianum) is a flowering herb in the same family as daisies and ragweed. This plant has been used for close to 2,000 years due to its medicinal properties with people and much more recently with birds. Used to treat liver issues in people, birds and other animals, milk thistle is generally considered safe for Polly, with few side effects. The main reason for administering milk thistle to birds and parrots is to treat liver issues. Liver disease in birds usually is caused by a poor diet, high in fat and calories, which can lead to a distended liver, breathing issues and poor feather quality. Chemical, viral or bacterial toxins also can cause liver disease. Because a bird's liver filters out the toxins, proteins and fats ingested by a bird, when the liver is overwhelmed by these substances, the liver can become damaged. Along with dietary changes and possible hospitalization with an avian vet, the vet may recommend adding milk thistle seeds or supplements to your bird's diet to help alleviate her liver issues. Milk thistle, and its active ingredient silymarin, generally is considered safe for use with birds and has few side effects. You can feed your bird milk thistle seeds or powders and liquid supplements containing milk thistle. One of the main side effects of milk thistle is diarrhea, loose stools and mild tummy upset in birds, according to the New Life Parrot Rescue & Helpline Service. Milk thistle can cause dark green to black stools as well. 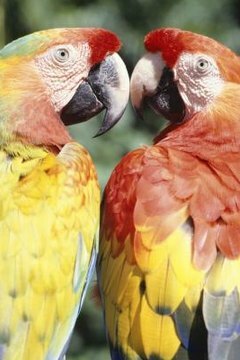 If giving your parrot a liquid milk thistle supplement, such as a tincture, don't use those containing ethyl alcohol, which can intoxicate the bird and possibly damage her liver, warns AvianWeb.com. A study published in the September 2010 issue of "Poultry Science" showed that chickens fed 1,000 mg/kg of silymarin from milk thistle, weren't protected from liver toxicosis due to gossypol. Similar results were published in the September 2009 issue of the "Journal of Avian Medicine and Surgery," showing that pigeons fed up to 100 mg/kg of milk thistle weren't protected from the toxic effects of B1 aflatoxin. Chicks in the womb did acquire improved immunity when given milk thistle according to a study published in the April 2010 issue of "British Poultry Science." Milk thistle also provided some protection against the harmful effects of the toxin Ochratoxin A, stated the June 2012 issue of the "Journal of Immunotoxicology." Even when given in large doses, milk thistle is generally not poisonous to birds, although it may or may not be effective in helping with liver issues, depending on the cause. Consult with your avian vet regarding the dosage of milk thistle seeds or milk thistle supplements for your particular bird, based on her size and condition. The Currumbin Valley Veterinary Services website recommends adding some greens, including clippings of the milk thistle plant and other types of thistle plants, to a bird's regular diet. These plants can provide healthy fiber for Polly. When choosing any plants to feed your bird, only give her those that haven't been treated with any pesticides, which can make her sick. Can Your Teddy Bear Hamster Drink Milk? Why Is a Quaker Parakeet Illegal in Some States?